No, I'm not actually talking about today’s elections. I’m sure some of you feel like that, though. Instead, I’m talking about a book review I wrote that was published today. The full title of the of the book is How to Survive the Apocalypse: Zombies, Cylons, Faith, and Politics at the End of the World. Here’s a portion of my review . . . He was trying to get me ready for what he believed just might be America’s impending dystopian future—whether caused by massive civil unrest, an electromagnetic pulse bomb . . . or something worse, something otherworldly. Truly: My friend is actually, actively preparing for the end of the world. 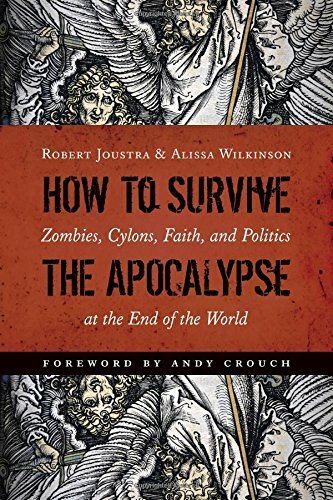 Professors Robert Joustra and Alissa Wilkinson wrote their book to do the same: to prepare us for the apocalypse. Their approach, however, is less Swiss Army Knife and more Encyclopedia Britannica. Drawing heavily—very heavily—from Canadian philosopher Charles Taylor, they show that apocalyptic art not only portends the future but also, perhaps mainly, reveals who we are now. The first several chapters provide philosophical and historical background. Then they move to cultural reflection. We learn about ourselves from shows like “Battlestar Galactica,” which is where the word cylon in the subtitle comes from. We learn from the antihero main characters in television shows like “Breaking Bad,” “Mad Men” and “House of Cards.” And we learn what living among the undead teaches about us in “The Walking Dead” and the movie World War Z. In the final chapter, the authors offer lessons from the prophet Daniel, not chiefly from his spectacular visions of the future but from his faithful courage and strategic compromises while living in Babylon. Here are two considerations readers might find helpful . . .
To read the rest of the review, go to EFCA NOW (the blog of the Evangelical Free Church of America).